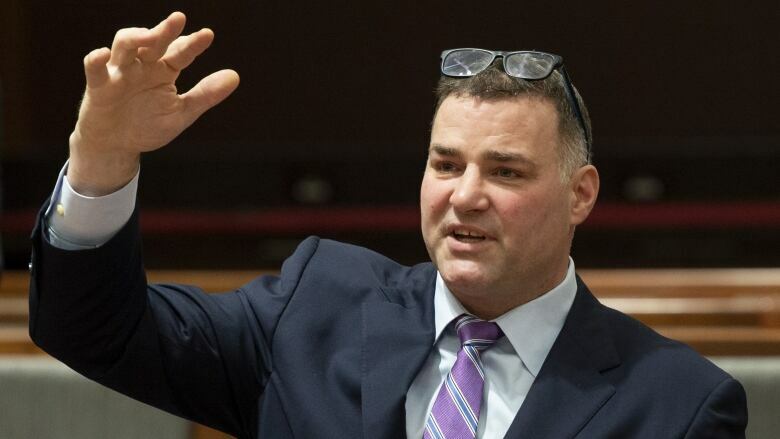 Former hockey great Eric Lindros brought his star power to Parliament Hill on Wednesday, urging MPs to develop a single national protocol for preventing and treating sports-related concussions. Among other things, Lindros suggested youngsters, whose brains are still developing, should have to take at least a few months off each year from rough-and-tumble sports to give their shaken brains a chance to heal. They should also be prevented from making hits on opponents until they're in their mid-teens, Lindros said, and any player who delivers a hit to the head should face a severe penalty. Lindros, whose own NHL career was cut short after he suffered repeated debilitating concussions, was testifying at a special House of Commons committee that is exploring what, if anything, the federal government should be doing about sports-related head injuries. However, the 45-year-old steered clear of commenting on the NHL or other professional sports. Indeed, he warned MPs they'd be wasting their time trying to persuade pro leagues to improve their protocols for concussion prevention and treatment. "Quite honestly, any time you mix athletics and money, the lines blur," Lindros told the committee. "I don't think you focus there. That's the top end." Rather, Lindros said the focus should be on peewee and junior sports, where kids can be taught a different culture about concussions that will eventually trickle up to the pros. On his way into the committee, Lindros said there are "a lot of good efforts" happening in different sports across the country to develop concussion protocols, but they vary from sport to sport and region to region. "In my opinion, I'd like to see them consolidated," he said. "Whether you're riding horses or playing soccer or hockey ... a concussion is a concussion." When he was a kid, Lindros said he used to take a break from playing hockey from May to September each year. But with kids now increasingly playing contact sports 12 months a year, Lindros likened their brains to a pick-up truck being driven repeatedly over bumpy roads. "[If] you don't every once in a while pull it in for servicing, something's going to fall apart. Sooner or later, it's inevitable." The committee also heard from former professional wrestler and college football player Chris Nowinski, founder and CEO of the Concussion Legacy Foundation. Nowinski said in the past, athletes were essentially shamed into continuing to play after suffering a concussion. Over the past dozen years, he said, there's been some progress in persuading young athletes that they "don't need to be a hero." The danger comes not just from outright concussions, but from receiving repeated hits to the head over time, which can lead to memory loss, cognitive decline, behavioural changes and mood disorders in later life, Nowinski said. And the earlier an athlete is exposed to head hits, the worse off he or she is likely to be in later life. Noting that government sets age limits for other dangerous activities, such as driving, drinking alcohol or smoking, Nowinski said: "Maybe we should regulate how often you're allowed to let your child get hit in the head or how many concussions you're allowed to have."